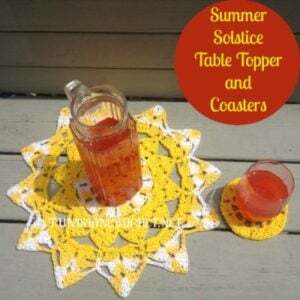 This gorgeous summer set is designed to be a table mat and coaster. However, don’t limit this beauty to the kitchen only, as it’ll look lovely in any room in the house. The pattern calls for a worsted weight cotton in two colors and a 6.00mm and a 5.00mm crochet hook. If you enjoyed this free crochet pattern you might also enjoy more designs by Tunisian Crochet or by American Crochet.